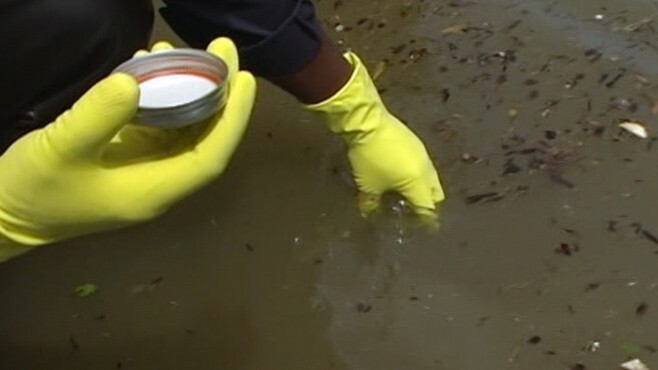 ABC News arranged some testing of its own, taking water samples from two places along the river to a laboratory near Memphis. E. coli and coliform -- commonly found in untreated waste water -- were 2,000 times acceptable limits. The lab did not find gasoline, oil or chemical toxins. There were trace levels of heavy metals, but no more than would be found ordinarily, the lab reported. Perhaps the largest effect: the overflow of nutrients into the Gulf of Mexico is likely to create an unusually large "dead zone" -- a giant patch of water off the Texas-Louisiana coast where fish and other marine creatures lack enough oxygen to survive. A dead zone forms there almost every July and August, but scientists said it will be bigger this year because algae, feeding on the excess fertilizer, will bloom and then die, choking off the oxygen supply. "I think it's the economic damage that's the biggest issue," said Nancy Rabalais of the Louisiana Universities Marine Consortium. "As long as people are vigilant, it won't be a people-living-in-the-water issue." ABC News' Steve Osumsami and Sarah Amos contributed information for this story.